I’m not the kind of gal that usually frequents a restaurant during its soft opening, but when I heard that there’d be fried-to-order doughnuts at UMAMIcatessen, I had to make an exception. Doughnuts are my rapture. UMAMIcatessen is located on a stretch of Broadway that’s lined with fluorescent-lit stores selling jewelry and poofy quinceanera dresses. Some might find this part of town a bit iffy, but I’ve been stuck in the suburbs for so long that I couldn’t get enough of its grit. I came in for an early dinner last Thursday night along with my friends Nastassia and Darin. The space was humming but not busy, so we were seated promptly at a table fit for four. By the time we left a few hours later, the entire room was packed with a line outside the door. News of fried-to-order doughnuts spreads quickly, I guess. 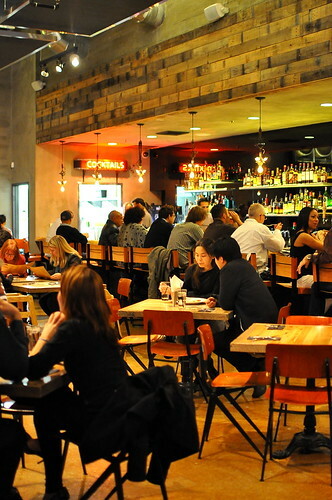 UMAMIcatessen, a genius creation of restauranteur Adam Fleischman (Umami Burger, Red Medicine, 800 Degrees), is widely referred to as a “food emporium.” Really though, its just a regular restaurant with a more-varied-than-most menu. 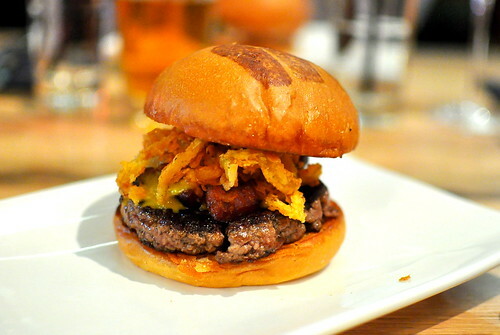 The soul of UMAMIcatessen is Umami Burger, a winning burger concept with six (and counting) locations in Los Angeles and one in San Francisco. 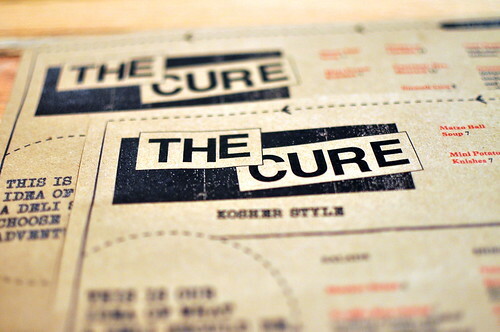 Also on the bill of fare are traditional deli dishes under the heading “The Cure.” The consulting chef is sadly not Robert Smith, but Micah Wexler of Mezze. San Francisco-based chef Chris Cosentino is the chief curator of the charcuterie and offal offerings under the P!GG portion of the menu. 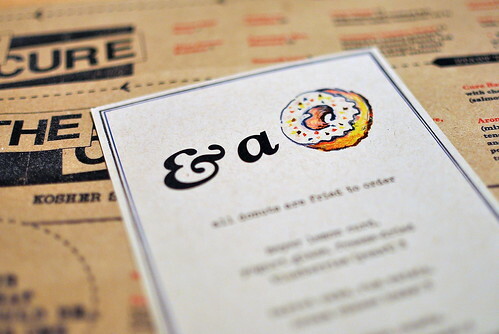 And finally and most alluringly is & a Doughnut. The pastry chef behind these deep-fried desserts is unknown. While Nastassia would’ve been perfectly content jumping right into doughnuts, I insisted that we have a proper dinner first. 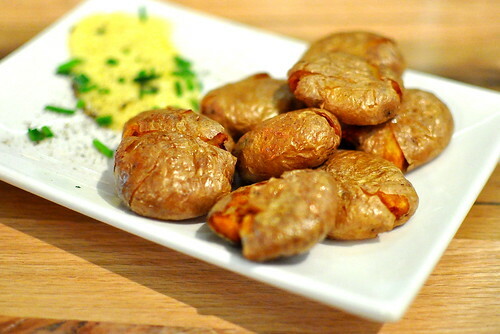 From the Umami Burger section of the menu, Nastassia selected the Smushed Potatoes ($4.50) to start. These double-fried Dutch Yellow Creamers served with a chive-flecked garlic aioli were totally adorable and so very delicious. For our mains, all three of us opted for burgers. Nastassia’s Manly Burger ($11) lived up to its name with beer-cheddar cheese, smoked-salt onion strings, and bacon lardons. She shared a generous hunk with me and I was really impressed. 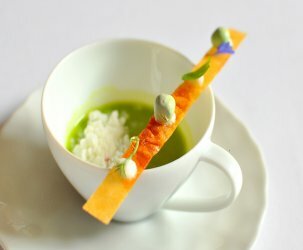 The combination of flavors was plain addictive, and the execution was spot on. 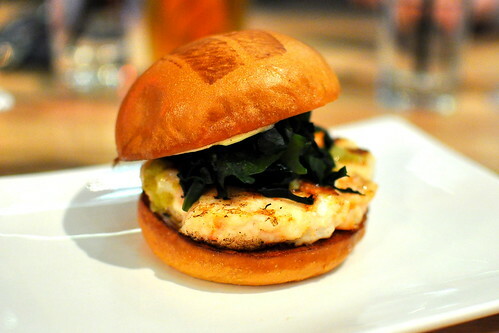 Darin and I split the Shrimp Burger with Yuzu Kosho ($13), which is only available at UMAMIcatessen. 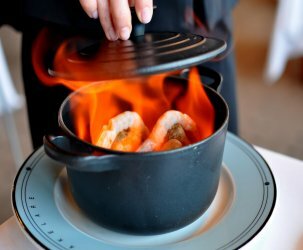 The combination of wild shrimp with tingly Japanese spices was not only unique, but damn tasty too. To supplement our shrimp burger, Darin and I also shared a Truffle Burger ($10). From the raring rare beef to the house-made truffle cheese to the ever-so-soft bun, I loved everything about this darling burger. 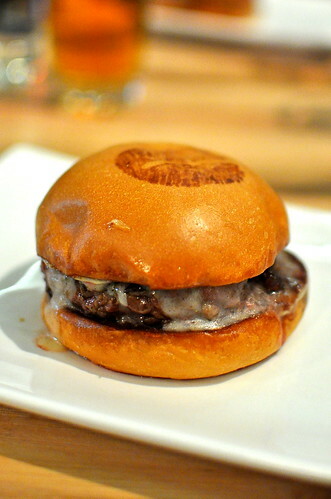 After tasting three of Umami’s creations, I am totally smitten with the brand. What took me so long to eat here, again? For dessert, we shared four sweet thangs from & a Doughnut. The first one we dug into was the German chocolate, which was topped with shredded coconut and crushed pecans and glazed in condensed milk ($3). Nastassia thought the cake doughnut tasted more oily than chocolaty, while I found it good but not particularly special. Needless to say, our minds were not blown. Shucks. 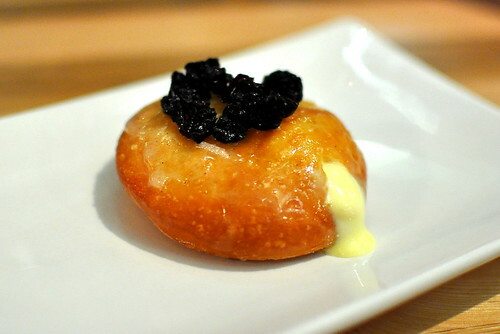 The next doughnut up to bat was filled with a runny Meyer lemon cream and garnished with freeze-dried blueberries ($3). The entire thing was covered in a yogurt glaze that our Knorks had difficulty surmounting. For a yeast-risen doughnut, this one was disappointingly dense and not the least bit pillowy. Strike two. Our final two doughnuts were a step above the initial ones. 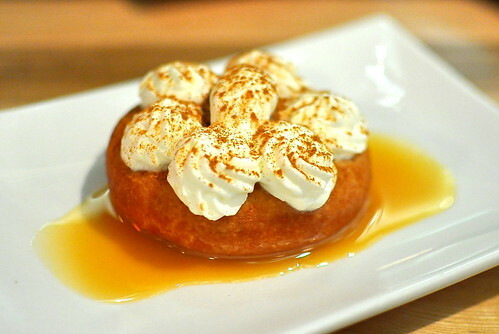 With the help of a caramelized and milky sauce, the tres leches ($4) cake doughnut had a tender and delightful quality to it. 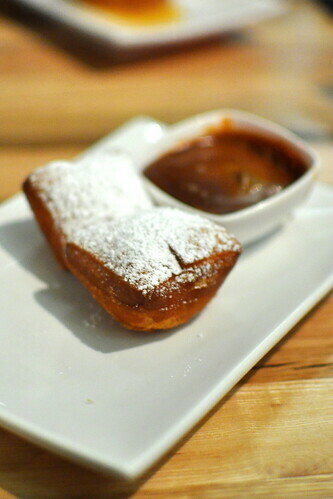 The run-of-the-mill biegnets ($4) were greatly enhanced by the thick, coffee-laced sauce served alongside. Nastassia and I were hoping to devour the doughnuts of our dreams at UMAMIcatessen, but alas, these doughnuts fell short, failing to deliver the deep-fried high we were after. 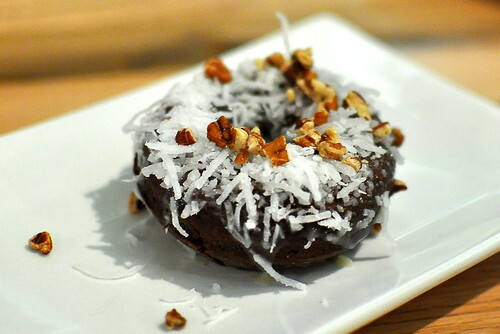 Even though & a Doughnut failed to meet my expectations, I still considered my meal at UMAMIcatessen a great success. 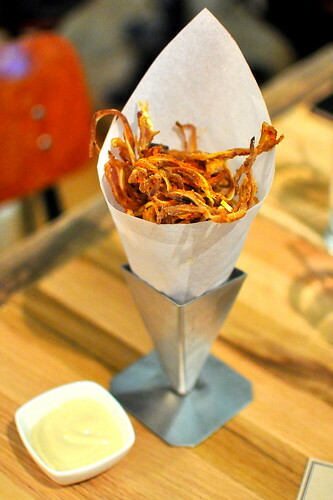 The pigs ears and spuds were tops, while the burgers converted me into an Umami believer. Plus, we met a “homelees mother fucker” looking to be adopted just outside the restaurant. It was a really good night. 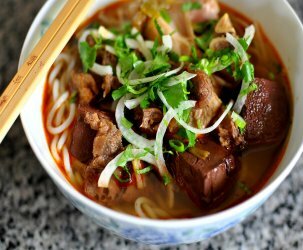 2) KNORKS! That is genius. 3) You seem like a really fun person to have a burger date with! 1) Is there some kind of design stamped on top of the burger buns? 2) Is the shrimp burger made of ground shrimp?? That’s also kind of genius! 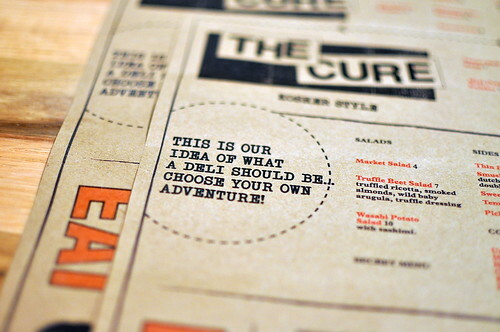 I’m having umami-envy… I’ve been to a mexicatessen that served churros, but nothing fried to order. I love smushed taters, and the brainaise with crispy pigs ears sounds pretty awesome too! I must say…that’s an excellent shot of you and Nastassia! Meister @ The Nervous Cook – Your neatly numbered comment brought a smile to my face. 1) When I hear the word “lardon,” my palms get sweaty and I want to get my LARD ON! 2) I have two Knorks in my household. They get very little use because they are quite heavy and my wrists are delicate. Still, I agree that they are a good idea. 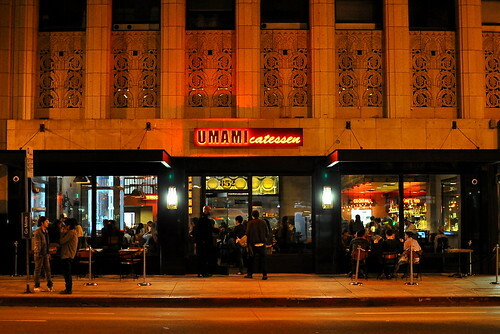 1) Yes, I believe it is a capital “U” for Umami. 2) Better than ground shrimp—SMUSHED shrimp. I’m not sure how they adhere to one another, but the results are fantastic. Darin – You should consider a second career as a portrait photographer specializing in women holding signs designed by “homelees mother fuckers.” 😉 Thanks for ordering the shrimp burger. The food looks good to me, once I recovered from the wince and eye roll at the name of the place. 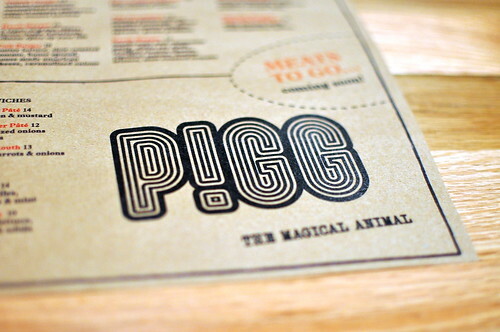 I bet Cosentino’s contributions to the menu are delicious–he is the pig man. Re: Lardons. I think they are best pronounced with a strong French accent and a, ahem, soft ‘n’. Mmmm shrimp burger – I could definitely make a diversion to Downtown LA for that! Bummer about the not-so-fried-to-order doughnuts. It’s my dream that you realize your dream of finding exquisitely fried pastry dough in LA. Shame about the doughnuts. 🙁 But very glad the burgers and sides made up for them! 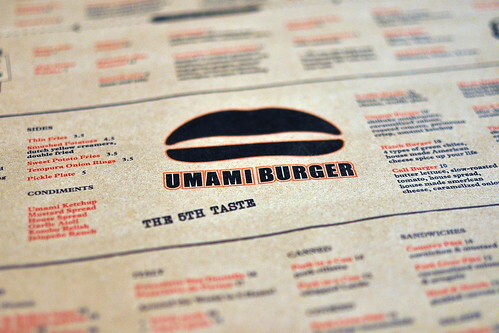 I’ve heard so much about umami burger and would live to try them one day! The shrimp burger sounds worth the trip alone, but the stamped buns kind of freak me out!